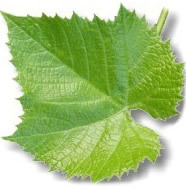 Wash grape leaves separately and blot dry. In a large bowl, combine meat, eggs, rice, half of the onions, salt and pepper. Taking 40-50 g of the meat mixture, form sausage shapes and roll into each grape leaf, the same as cabbage rolls. Place into a large shallow pan and cover with water. Cook at medium heat for 30-40 minutes. Heat oil in a large pan and cook the other half of the onions till caramelized. Add the dill and 1 tbsp flour and stir till a gold colour. Gradually add the broth from the stuffed grape leaves and whisk to a sauce consistency. If the sauce is too thin, thicken with a sauce powder or 1-2 tbsp instant potato powder. Season to taste with lemon juice, salt, sugar and pepper. Please use only biologically clean leaves! 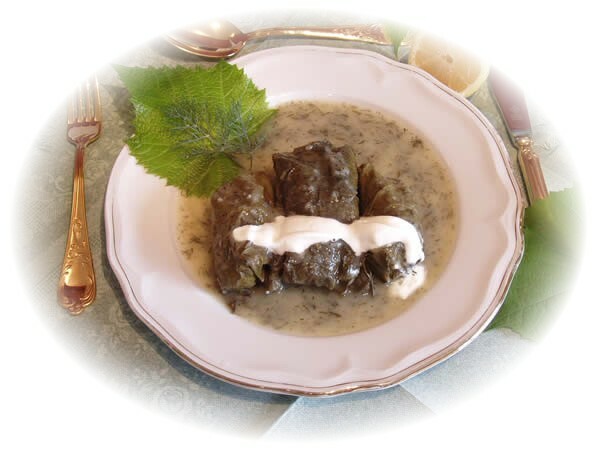 Pour over stuffed grape leaves and serve with sour cream.